Rogue Cartoonist: Corporate Media: A Dead Dinosaur. 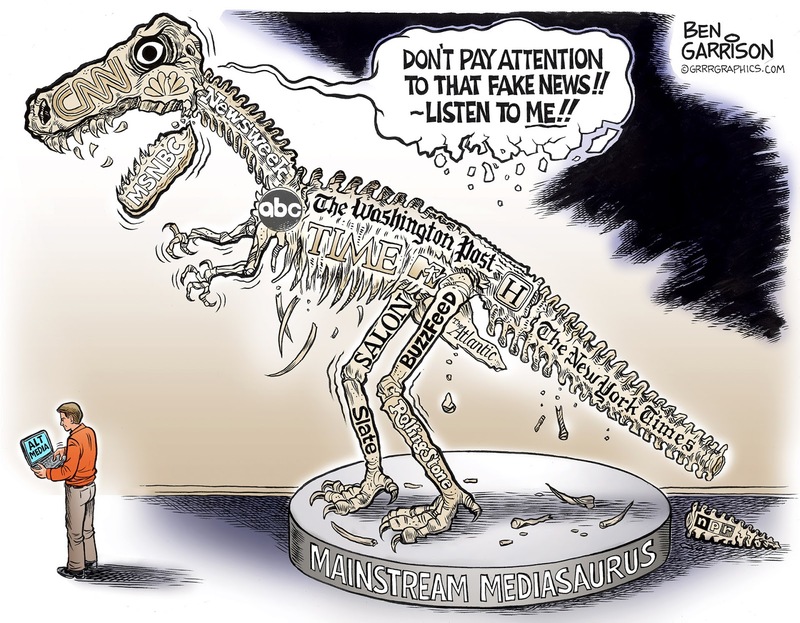 Corporate Media: A Dead Dinosaur. In some corners it’s crudely referred to as “Piss Gate.” It’s a disgusting and completely fictional event that led to the latest desperation exhibited by the mainstream media, who passed the story along as ’news.' When it comes to attacking Trump, they respect no boundary. They have no shame. They are no longer journalists. They don’t bother to do research or basic fact checking. If some prurient rumor affects Trump negatively then they go with it, no questions asked. They have no sense of balance, fairness or decency. Trump was right to castigate CNN. They have degenerated into a fake news outlet. They are shrill shills for their globalist, collectivist masters. The mainstream media are owned by a handful of global corporations. They are used to having the narrative locked up. They consider themselves owners of the 'final say.’ They think of themselves as ‘authorities’ when it comes to the truth. They’ve grown accustomed to scripting the news in order to control and brainwash the populace. The people have now awakened thanks to alternative media sources available on the Internet. The elite can’t stand the fact that an outsider, a populist, was elected president and have now revealed themselves for what they are—purveyors of fake news. This is why Obama and the people he represents are anxious to gain control of Internet news and discourse. They want Chinese style censorship. We must remain vigilant and not let this happen. We need to continue to shine the light on their plans. The mainstream liars are losing readers and viewers because they are liars. They deserve to become extinct.